The Standard Hollywood, 8300 Sunset Blvd. The West Hollywood City Council won’t take a final vote until Monday on an ordinance that would allow the sale of recreational marijuana in WeHo. 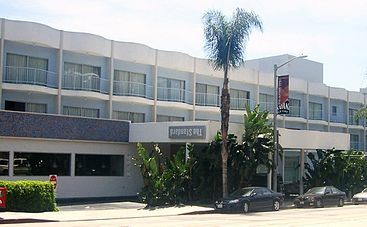 However that hasn’t stopped the Standard Hollywood hotel (which, despite the name, is in West Hollywood) and Lord Jones, a maker of cannabis products, from announcing the opening of a retail cannabis shop in the hotel’s lobby early next year. The announcement, first reported in the Los Angeles Times, quotes Robert Rosenheck, founder of Lord Jones, as saying the 300-square-foot shop will be just to the right of the hotel’s main entrance at 8300 Sunset Blvd. near Sweetzer. Rosenheck said the shop will carry Lord Jones-branded candies with THC (tetrahydrocannabinol — the chemical compound in cannabis responsible for a euphoric high), skin products with THC and “smokable products” by other brands. Lord Jones covered sea salt caramel, made of sugar, cream, vanilla bean and butter covered with dark chocolate and infused with cannabis extract. The announcement by Lord Jones and The Standard comes only a few weeks after the City Council spent more than three hours going through City Hall recommendations for how to regulate cannabis sales in West Hollywood and how to decide who would get a license for such sales. The Council decided on Nov, 6 to give its initial okay to an ordinance that would permit the city to grant up to eight licenses to recreational marijuana stores, eight to medical marijuana dispensaries, eight to lounges offering edible marijuana products, eight to lounges also allowing the smoking or “vaping” of marijuana and eight to locally based delivery services. The approval process for license applicants could be lengthy. If the Council gives its final approval to the ordinance on Monday, applications can be submitted in January and will be reviewed in February and March of next year. Top applicants will have to be approved to operate their businesses within the proposed zoning area, a process that would take place in March and April. Final approvals would be granted in April and June, meaning Lord Jones likely wouldn’t open its shop until the Spring, assuming it gets both the required city and state licenses. Rosenheck told the L.A. Times that he was making the announcement now because he wanted to state that this will be the first cannabis shop opened in a hotel in the United States. Lord Jones is stating “alternative facts.” Hicksville Pines in Idyllwild was the first to announce they’d be opening a dispensary on August 25th via instagram. There have been several articles about it in the months since. Who actually opens first will be dependent on the red tape of West Hollywood and Riverside County. Obviously, this Hotel that announced the shop is in the wrong. I don’t believe the new ordinance will be no more confusing that when Medical Marijuana was first approved. Let the City do its thing before we make pronouncements. This whole thing is going to be a mess. Thanks CA voters.